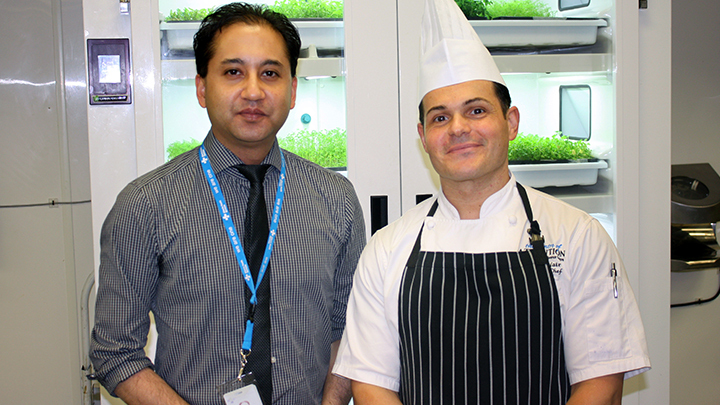 Michael Khan, left, an Environmental Public Health Officer for AHS in Edmonton Zone, works with Serge Belair, Executive Chef of the Shaw Conference Centre, as well as with other agencies involved in the Second Helping program to ensure that food isn’t wasted and people in need are getting healthy meals. The Second Helping program is a partnership with the Edmonton Food Bank. EDMONTON — If you’ve ever thrown a dinner party, you know it’s always a good idea to make a little extra. But when your party is for 1,000 people — and you have leftovers for 100 — it gets a little trickier. That’s the thinking behind Second Helping, an ongoing partnership between Edmonton’s Food Bank and Alberta Health Services (AHS) that prevents waste and puts nutritious meals on the table for those who need them. Second Helping is a prepared and perishable food recovery program that accepts wholesome surplus food donated by cafeterias, restaurants, hotels and institutions and delivers them to agencies supported by the Food Bank. “I think it’s great that AHS can advocate for and support these kinds of programs,” says Michael Khan, Environmental Public Health Officer for AHS in Edmonton Zone. Khan also regularly visits the Food Bank, where the donations are stored, to make sure the food is labeled, stored and properly sealed for when recipient organizations pick it up. Active donors to the program, launched in 2009, include the Shaw Conference Centre, Northlands and Rogers Place. Serge Belair, Executive Chef at the Shaw Conference Centre, says the program aligns perfectly with the convention centre’s brand promise of sustainability and community impact. He estimates they donate 6,600 lbs. of food each year. Since 2011, member organizations have donated about 180,000 lbs. of food. Recipient organizations, such as Hope Mission, feed hundreds of Edmontonians in need every day. “Having a warm meal to keep our guests full and healthy can be life or death for them,” says Robin Padanyi, a spokesperson for Hope Mission. For Khan, the program gives him a chance to do something other than enforcement, which he finds rewarding on an entirely different level.